Thank you for coming to our first fall open studios. It is always so great to see you. We saw old friends and met new. Our "place" is just over a year old.... with the first artists (Gaby Grossman, Deb Wheeler Bean, Dawn Amey and myself) having moved in during very early 2017. A few months later, we welcomed Anne Kenny and Wo Schiffman. And now we have other artist applicants in progress. Our goal is to stay a little out-of-the-box while we create "stuff" and nurture our artist selves. Thank you for your words and your show of support for us and local art.... it means everything. Whimsical, fun, bright, blues, oranges, BIG, aqua, coral, sea green, yellows.... all words used to describe the direction for this piece. Each panel is 20x40. When together, the entire piece is 60x40. The wall it will live on is yellow and the space is a large, bright, open concept. Can't wait to see a photo of this in place.... "Cats in the Water", 60x40 acrylic on gallery wrapped canvas. Thank you Brenda B! So many ways to enjoy color.... full blast, with texture... or softly muted with understated simplicity. The range is broad (thank goodness) ..... limitless ways to excite the eye and the heart. 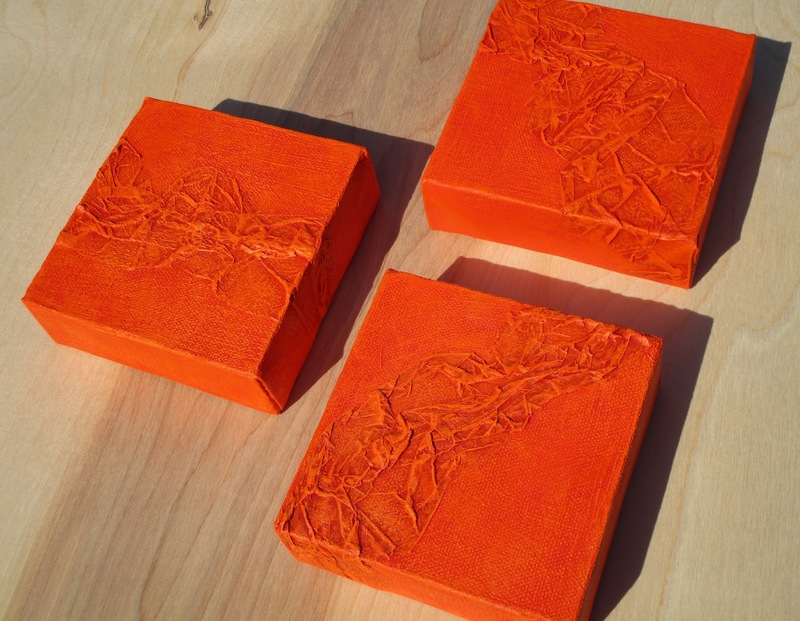 One of these little 3x3 morsels was purchased at the May Open Studios. Then ... the same collector decided she needed another. THEN, a few days later the same collector felt three would be best. Thank you, Amy, for welcoming these to your home. I hope they keep you in good energy. Fresh off the easel "Blues" 18x36 inch original painting. Beautiful day yesterday to paint. I set up on the porch at Art Up Front Street. The breeze was mighty.... the ribbons on the columns danced around the posts and at times were horizontal. So beautiful to watch. I tried to anticipate the directions they would take, but could not. Randomness inspires. I love this painting. Yep, I do. It is 12x36 inches of full and bold. It was an experiment in color and texture... just the way I love to do things. And the bonus? ...time spent with the new owners. The couple that purchased my art has a passion for making things ... She is an artist and he makes teeth. Yes. Really... how can you not want to talk with them and know more. It was so easy to see they love life, love each other. The conversation topic? Exploration. They are considering starting an arts collective or business studio space in Newburyport if they can find the right property. It would be perfect for them. They both make things. They love community. They want to work NEAR each other and not travel great distances. I am not the Long Island Medium, but something tells me adventure is ahead for them. Of course this kind of information makes my heart dance. I will stay in touch with them and let you know what they get in to. Thank you L and J. Good luck in your travels! Putting the finishing touches on things at the studio. My latest piece will be paddling your way (I know... really bad pun if you can even call it that :-) next weekend. We hope to see you. "I want to explore something different..... I need a little time to nurture my soul..... I really want to paint something for my child's room.... my sister.... my first art show....."
I hear so many good reasons for stepping out of the box to make that first move... or to rekindle creativity. I work with adults on a very flexible basis. If you want one-on-one time to do drawing or beginning acrylic painting... or ... if you would rather paint in your own studio and only want the occasional consultation, arrangements can be made. Times are generally, 10am or 1pm on Tuesdays, Wednesdays and Thursdays. The cost is $40 an hour. I schedule the same one-hour time slot for you each week. We can meet every week, every other week, or schedule consultations once a month. We can work either inside the gallery surrounded by art or outside in the studio garden surrounded by nature. .... currently taking sign-ups. Contact me if you have questions or want to take a studio tour to see if this is a good fit for you. Today the light is AMAZING against the snow. In my mind I see soft lavender, soft periwinkle blue, soft pinks and touches of yellow to suggest snow (even though snow is white). Thinking in these terms makes the process even more exciting and challenging. So today... I am working on a winter painting.... details to follow. There will be no loss for subject matter ideas... as there is another storm a brewin'. In the meantime, if you have not done so already, take a look at ART UP FRONT STREET. My studio is there as well as the studios of 3 other artists.... Deb Wheeler Bean, Gaby Grossman, and Dawn Amey. There are the beginnings of a great collaboration starting here.... see you soon :-) .